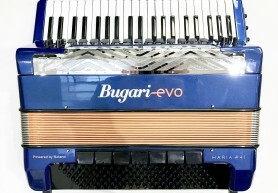 Bugari Evo Haria P41 120 Bass Digital Accordion – Now in stock! Here at The Accordion Shop we are pleased to be able to offer a range of midi, digital and electronic accordions in addition to our extensive acoustic range. These popular models are ideal for both professional and amateur players who wish to enhance their sound with a wide range of additional virtual tones, effects and percussion sounds. Midi accordions are also ideal for recording with in the studio, and enables the accordion accordion to be converted into a midi controller for inputting notes etc. Please note, a midi expander and an amplifier, both of which can be purchased from us, will be required in order to get the most out of a midi accordion. 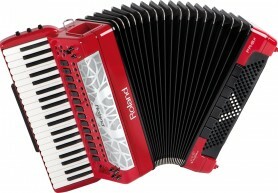 Virtual accordions also feature midi, but are quite a different instrument. 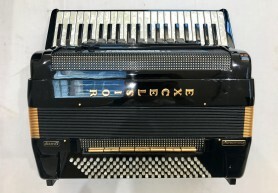 While most midi accordions are a traditional acoustic model fitted with a midi system, the Roland V Accordion range is a fully digital accordion with no reeds or moving parts. Please visit our dedicated page for further information on this innovative range of virtual instruments. 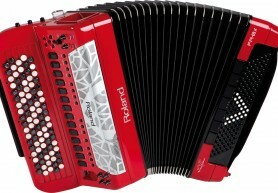 For further information on either midi or virtual accordions, please don’t hesitate to contact us.